To purchase a copy of "Guide to the Art and Architecture of the New Deal" — they’re $3 apiece — or to learn more, visit the Living New Deal website. The New Deal goes back to the Great Depression and Franklin D. Roosevelt, but its legacy is all around us, from Coit Tower to the Berkeley Rose Garden and right here on campus. The Living New Deal — a UC Berkeley-based project dedicated to documenting the vast treasury of public art, park trails, schools, civic buildings and more it produced during the decade from 1933 to 1943 — has just published its first "Guide to the Art and Architecture of the New Deal," a pocket map and guide to 18 key sites in San Francisco. The guide, the first in a series, was introduced Thursday (May 7) at a celebratory event — co-hosted by the California Historical Society at its Mission Street headquarters — that was part book party, part commemoration of the 80th anniversary of the Works Progress Administration, the work-relief program that created jobs for more than 8 million Americans, who in turn built bridges, roads and parks all over the country. 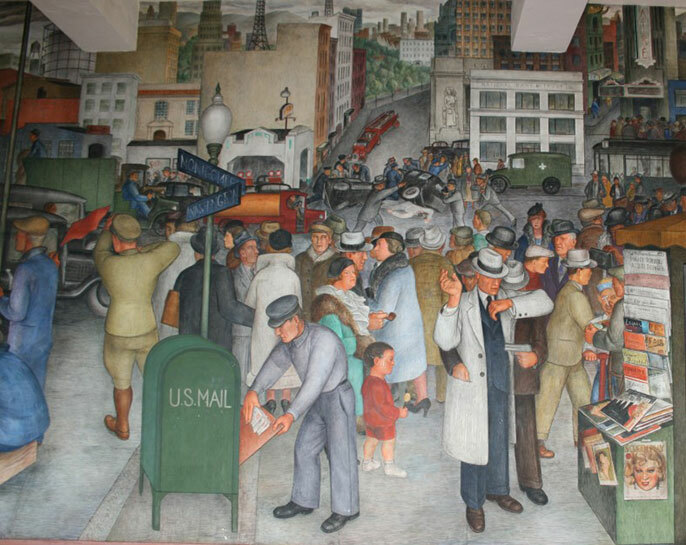 San Francisco was among the WPA’s notable beneficiaries — the Living New Deal team has identified more than 300 of its public-works projects — as were New York City and Washington, D.C., both of which are slated to get guides of their own. The project, directed by Berkeley emeritus geography professor Richard Walker, is building a national database of thousands of documents, photographs and personal stories about public works made possible by the New Deal.